The Voter Awareness Council (VAC) is pleased to announce that it is hosting an informal “meet and greet”, “come and go” reception open to all candidates on the November 2018 election ballot and the general public. 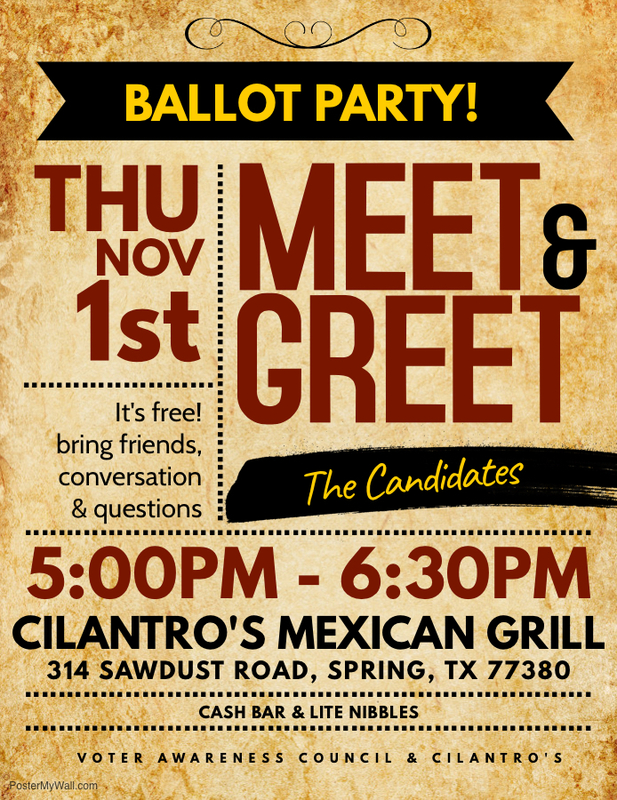 The reception will be held Thursday, November 1st from 5:00 – 6:30 pm at Cilantro’s Mexican Grill located at 314 Sawdust Rd., The Woodlands, TX 77380. Light refreshments will be served accompanied by a cash bar. All candidates on the ballot are welcome as are all voters who would like an opportunity to visit with the candidates. There will be no campaign speeches but a table will be available for campaign push cards/literature (no yard signs please). This event is intended to give voters an opportunity to chat informally with candidates. It is also a statement that we are all grateful to the candidates for their willingness to serve our community. “After a long and arduous election season our organization has found it both enjoyable and useful to have a low key social event for both candidates and voters alike” says VAC member Faisal Amin and initiator of this event. “With the intensity built into any election cycle we think it’s time to simply have a social get together” adds Mr. Amin. For further information on this event please contact Faisal Amin at famin@thinkbrg.com or VAC President Steve Leakey at spleakey@yahoo.com.